This switch is no longer available to buy from ProVu. Check out our list of current network switches. 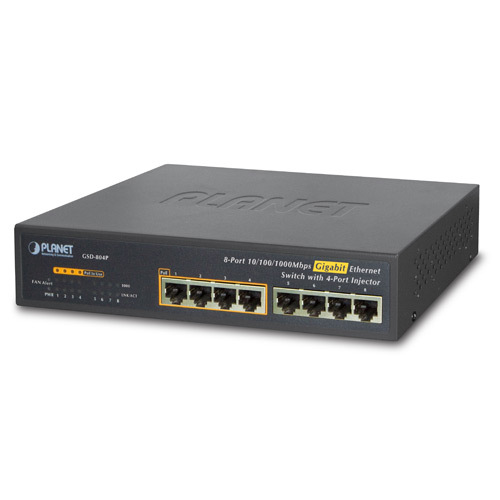 The PLANET GSD-804P is a 8-Port 10/100/1000Mbps with 4-Port PoE Switch. This switch provides 8 RJ-45 10/100/1000Mbps ports for a high-speed network connectivity. This switch can provide power (up to 15.4 Watts) to 4 compliant powered devices. With Gigabit throughput and four 802.3af PoE interfaces supported, the GSD-804P is ideal for small business to efficiently deploy PoE on the network for IP door entry or IP loud speakers which can be awkward to get power cables to.